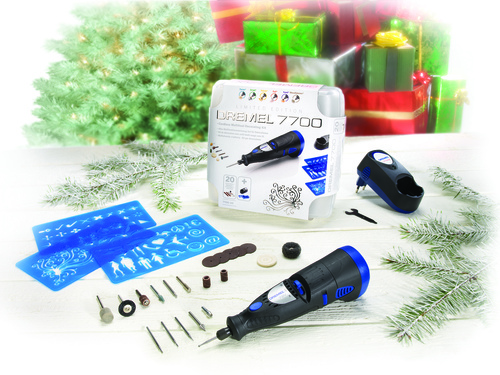 Leading tool brand Dremel has two special gift sets this Christmas that will appeal to anyone keen on DIY or hobbies and crafts. The Dremel 300 Black Edition offers everything you need to get started in DIY - the iconic 300 Series multi-tool plus five outstanding attachments: a line & circle cutter, a flexshaft, a detailer's grip, a multipurpose cutting kit and a shaping platform. The Dremel Black Edition also contains 45 handy accessories and comes packed in a luxury black toolbox. Perfect for all manner of DIY and other projects, such as grinding, carving, routing, sanding and cutting. Priced £89.99 from B&Q, or online at www.amazon.co.uk and www.tool-shop.co.uk - saving a huge £85 on the usual selling price. The Dremel 7700 White Edition is for the creative crafter or hobbyist on your Christmas shopping list. This kit comprises the versatile Dremel 7700 cordless multi-tool, five engraving accessories, 15 multipurpose accessories and two ready-made engraving templates - presented in a stylish, translucent white storage case. It's a great kit for decorative hobbies, general crafts and seasonal adornments in glass, wood, ceramic, paper and other materials. The Dremel White Edition is specially priced at £49.99 - saving nearly £35 - from B&Q, www.amazon.co.uk or www.tool-shop.co.uk. This press release was distributed by ResponseSource Press Release Wire on behalf of Starfish Communications in the following categories: Men's Interest, Leisure & Hobbies, Home & Garden, Women's Interest & Beauty, Construction & Property, for more information visit https://pressreleasewire.responsesource.com/about.